Main Street Liberal: He Loves The Country Of His Own Imagination. 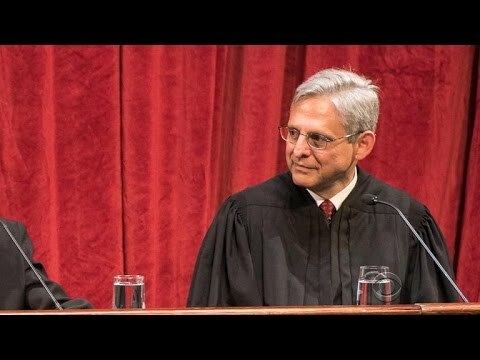 America isn't Congress. America isn't Washington. America is the striving immigrant who starts a business or the mom who works two low-wage jobs to give her kid a better life! America is the union leader and the CEO who put aside their differences to make the economy stronger. America is the student who defies the odds to become the first in a family to go to college, the citizen who defies the cynics and goes out there and votes, the young person who comes out of the shadows to demand the right to dream! That's what America's about. Folks, that... I'm telling you, that tells you everything you need to know -- if you just listen to it -- about how Barack Obama and people like him look at this country. "America is the striving immigrant who starts a business." We're gonna get a list of victims here. America is a list of victims. America is the land of the oppressed overcoming the evil majority. That's what America is. America is the schlubs of life getting even with the majority who would keep them down. That's what America is. There's no exceptionalism. There's no optimism. There's no greatness. America is the land of grievances! America is a land of anger being redeemed and grievance being rewarded. America is a land of victims taking control. The striving immigrant who starts a business, the mom who works two low-wage jobs to give her kid a better life. Abroad, American leadership is the one constant in an uncertain world. It is America that has the capacity and the will to mobilize the world against terrorists. It is America that has rallied the world against Russian aggression, and in support of the Ukrainian peoples' right to determine their own destiny. It is America — our scientists, our doctors, our know-how — that can help contain and cure the outbreak of Ebola. It is America that helped remove and destroy Syria's declared chemical weapons so they cannot pose a threat to the Syrian people — or the world — again. And it is America that is helping Muslim communities around the world not just in the fight against terrorism, but in the fight for opportunity, tolerance, and a more hopeful future. America, our endless blessings bestow an enduring burden. But as Americans, we welcome our responsibility to lead. From Europe to Asia — from the far reaches of Africa to war-torn capitals of the Middle East — we stand for freedom, for justice, for dignity. These are values that have guided our nation since its founding. Opportunity and tolerance; freedom, justice, dignity. Aside from- arguably- freedom (at least for those "job creators"), those are values Limbaugh and many of his fellow travelers find alien. Rush maintains in Obama's world "there's no greatness" and "there's no optimism." But there may be nothing more optimistic (nor more American) than a "student who defies the odds to become the first in a family to go to college." It was the dream of millions of American families... and remains so, though the color or ethnicity of that family has undergone some change over the decades. That, too, is America. There may be, further, few things any more important than a union leader and a CEO putting "aside their differences to make the economy stronger"- or simply to give the worker a chance while allowing the company to prosper. Nor is there anything more representative of America today than a "striving immigrant who starts a business or the mom who works two low-wage jobs to give her kid a better life." No one has to be reminded that Limbaugh and his ilk don't like immigrants- even if legal. Less well understood is his utter, and frequently implied, contempt for working-class or middle class Americans who simply work hard but (failing to be millionaires) are "losers" to a certain class of conservatives, though they still must be grateful to those "job creators." Those whom Limbaugh derides as "the schlubs of life" have a different view of opportunity(chart, below from two economists but via Mother Jones) than the billionaire talk show host. Yet, what really inflames the conservative psyche, the real affront to the right-wing framework, is "the citizen who defies the cynics and goes out there and votes." There is more than one reason the Democratic Party sponsored a nationwide voter-registration drive dubbed the Bannock Street Project. 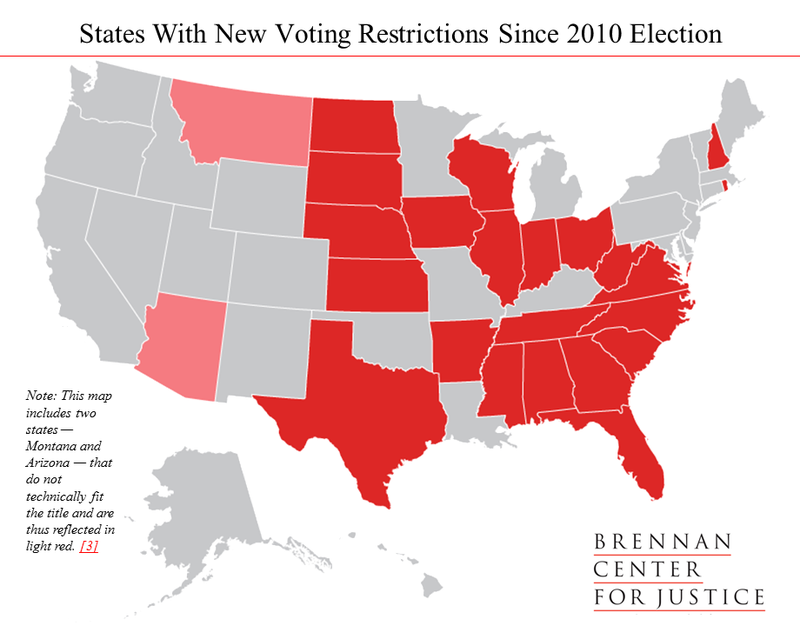 Since the elections of 2010, voter restriction and/or suppression has been the rage across the nation as illustrated in the map below from the Brennan Center for Justice. Usually, these efforts have been led by Republicans, wary that most individuals who would be discouraged or barred from voting are from Democratic-leaning demographic groups. Aside from that factor, however, conservatives simply have a different view of casting a political preference, one in sharp contrast to celebrating "the citizen who defies the cynics and goes out there and votes." "America is the land of the oppressed overcoming the evil majority," Limbaugh sarcastically contends. He probably remembers the civil rights anthem "we shall overcome." The greatness of America, he believes, is reflected when the few truly privileged individuals gather even more at the expense of the many. For the rest of the us, the majority, America is the land of individuals, families, and communities facing obstacles and, often banding together, overcoming those obstacles.